WATERLOO — Betty Ann Beck, 76, of Cedar Falls Health Care Center, died there Saturday, Oct. 2. 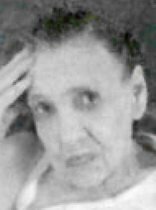 She was born Aug. 23, 1934, in Janesville, daughter of Cecil and Rose Minikus Rockwood. She married Marvin Allen Beck in March 1956 in Waterloo. He died Sept. 8, 2001. Mrs. Beck received her education in the Janesville and Cedar Falls schools. She lived in Waukon and Waterloo, where she was employed in housekeeping and restaurant work. Survived by: four sons, Stan Schroder of Cedar Falls, Vernon Beck, Mokey (Donna) Beck of Waterloo and Kimmey (Jodie) of New Hampton; two daughters, Charmin (Howard) Conkling of Waterloo and Edna (Dwayne Bennett) Beck of Cedar Falls; 34 grandchildren; 40 great-grandchildren; and two sisters, Judy Elliott and Della Grandon, both of Cedar Falls. Preceded in death by: a stepdaughter, Myra Jean Beck; a granddaughter; and a great granddaughter.